Make your own flower jewelry! You can embellish a simple outfit when you learn how to craft a fabric flower brooch. These easy projects make a great gift for a friend or a fun way to treat yourself to a little funky floral style. Fabric flowers have been around for centuries, and there are many reasons for their sustained popularity. Floral crafts are both easy and affordable. Unlike real flowers, they never lose their beauty. They can also be used in a multitude of ways, and jewelry projects are a natural choice for these pretty blooms. Flower brooches are an excellent way to celebrate spring or summer or simply bring a little extra cheer to your fashion ensemble. Most crafters have bits of beautiful ribbons or fabric pieces that they just can't throw away, and flower brooches are the perfect project to put these treasures to use. When you use scrap fabric to create your project, the cost of your materials will be almost nothing. You'll also have the added satisfaction of seeing your favorite fabrics displayed in a beautiful way. So start digging through your scrap bag, and get ready to create a garden of beautiful flower brooches! If you have a favorite wool sweater that has a stain or was shrunk in the wash, this craft is for you. You'll be able to reuse cast-off articles of clothing to make something completely new. You can also create these brooches using fabric scraps instead of sweaters; just be sure to use Fray Check or a similar product to keep raw edges from unraveling. Use your washing machine to felt the sweater. Using a small amount of laundry detergent, wash the sweater in hot water and dry it in the dryer. When you're done with this step, your sweater will be much smaller, and the fabric will be dense and fuzzy. With the scissors, cut several flower shapes out of the felted sweater. Make the shapes in different sizes for a textured look. There's no need to worry about the sweater unraveling, since the felting process causes the wool fibers to tightly interlock. Stack the flower shapes, and use the needle and thread to baste them together. Sew the safety pin to the back of the flower brooch. Sew the button onto the front of the brooch, creating a center for your flower. You can choose a button in a fun color or select one that has sentimental meaning. You can buy ribbon roses at your local craft store, but it's even more fun to make them. This is an excellent way to use your favorite ribbon scraps. Ribbon pieces should be at least 18 inches long for this craft. Choose a piece of ribbon. Using big stitches, sew near one edge along the length of the piece. Do not tie off your stitches. 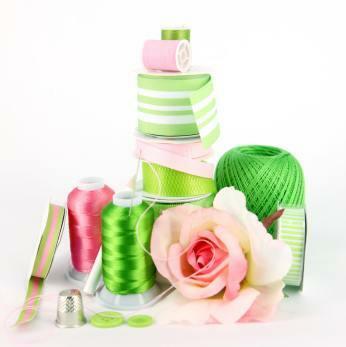 Grasp the loose end of your thread and pull, gathering the ribbon into a ruffle. Tie off your thread. Starting at one end, coil the ribbon into a flower shape. Make several stitches through the bottom of the bloom to secure it. Repeat this process with other pieces of ribbon. When you have a few ribbon roses, you can arrange them to create a brooch. Starting with the largest rose, begin attaching the flowers to your safety pin using the needle and thread. When you're done, you'll have a ribbon rose corsage. Experiment for Even More Floral Fun! Now that you've tried these projects, you'll find yourself coming up with even more ideas about how to craft a fabric flower brooch. Keep experimenting with new ideas, and you'll find that your project will become art, as well as a craft.